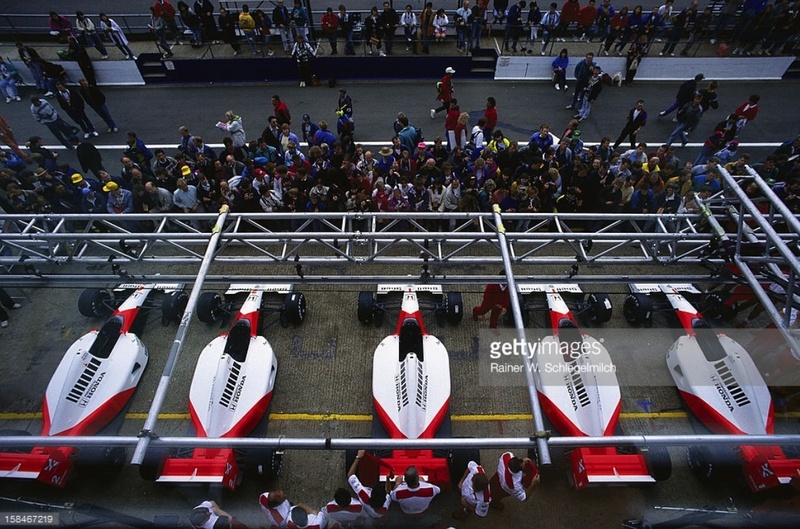 Whilst this article is a summary of McLaren’s ultimately successful 1991 season of changing fortunes with its new Honda V12 powered McLaren MP4/6- all of the photographs are by Rainer Schlegelmilch and were taken over the Silverstone British GP weekend of 11 to 14 July. 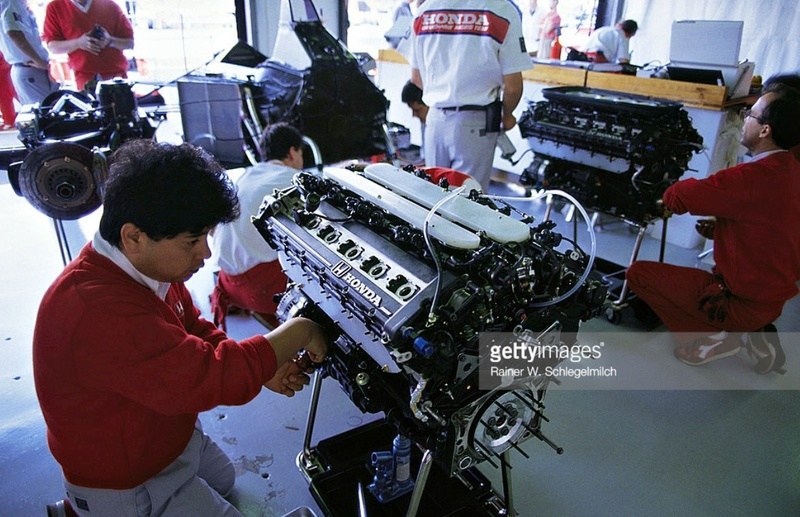 This was Honda’s third different type of engine in four seasons- a new 3.5 litre 60˚ V12 unit with greater piston area than the outgoing V10 it replaced and therefore it had a potentially higher rev limit. More revs, all things being equal, results in more power. It was not without its chassis design and packaging issues, the motor was longer, heavier and thirstier than the V10 it replaced but the anticipated 720bhp should have been more than enough, on balance to make the car faster. When first tested by Ayrton Senna in an MP4/6C test-mule, he was far from impressed and said as much to the Japanese. 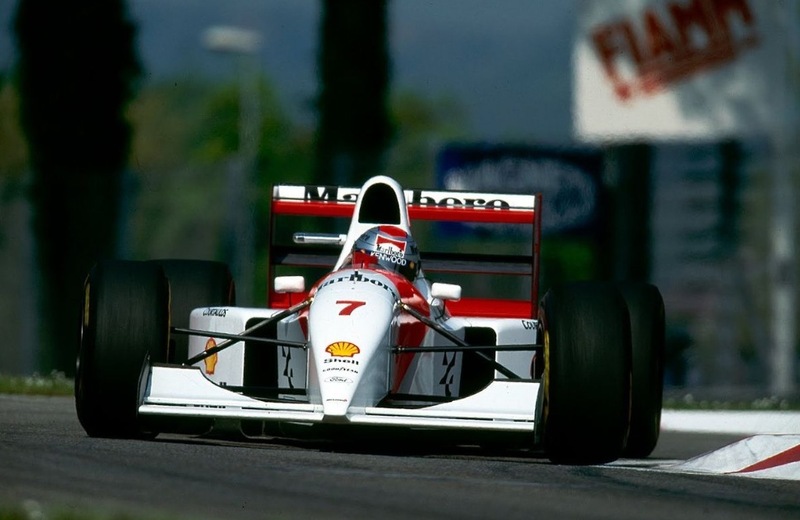 The Honda people persevered of course, and McLaren’s season got off to a great start with four wins on the trot. The increased engine weight was partially offset by the latest development of McLaren’s six-speed manual, transverse Weisman/McLaren gearbox. 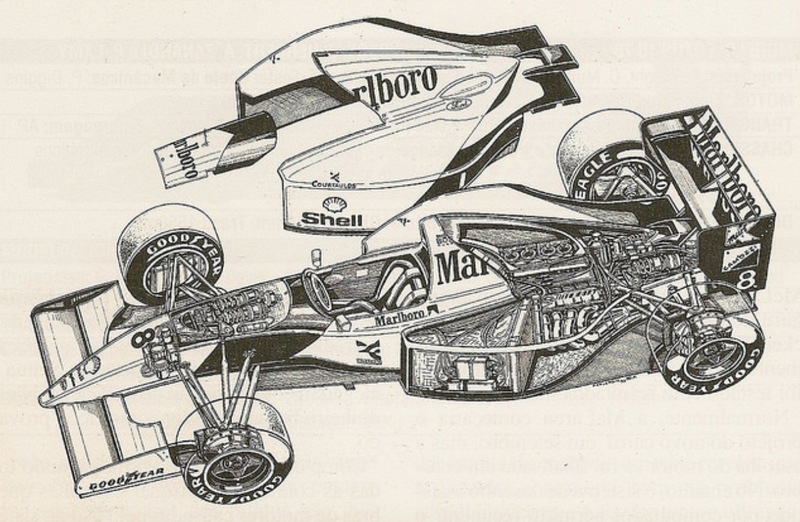 Whilst visually similar to the outgoing MP4/5B, the new cars aerodynamic profile was different as designer Neil Oatley and his team had received fresh perspective and input from Henri Durand who had jumped ship from Ferrari to McLaren in mid-1990. Many changes had to be made to the chassis to accommodate the longer engine and enlarged fuel cell needed to satisfy its greater thirst. Despite additional length, the new tub was much stiffer in terms of torsional rigidity and comprised fewer basic components than its predecessors. There were changes to the suspension too. The pushrod-activated coil-spring/dampers were now mounted on top of the chassis ahead of the cockpit instead of being installed vertically on either side of the footwell. The increased fuel consumption presented lots of challenges. 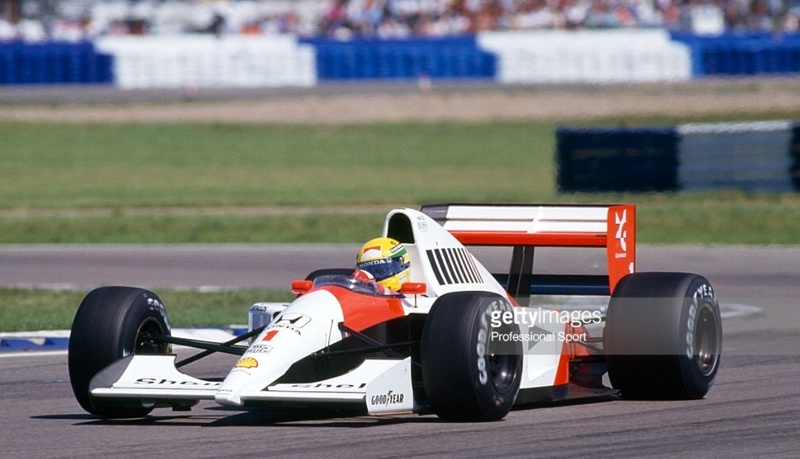 Despite plenty of development on the engine management system, Senna twice ran out of fuel (at Silverstone and Hockenheim) but the Brazilian Ace and his new car remained unbeaten up to and including Monaco- giving McLaren a comfortable lead in the Constructors‘ Cup at that stage of the season. This margin was to prove crucially important as the team’s performance began to slip and Williams Renault began to gather pace with Nigel Mansell and Riccardo Patrese threatening as the Williams FW14 Renault V10’s reliability improved. ‘In Montreal two things quickly became apparent. The first was that the Honda’s extra power was simply to offset its greater weight relative to the V10s, particularly when its internal frictional losses continued to rise. The other was that the Williams FW14s, particularly Mansell’s, were really getting into their stride’ wrote McLaren. Honda, of course continued development of its V12. The ‘Spec 1’, which won at Phoenix, Interlagos and Monaco was replaced by ‘Spec 2’- introduced ahead of Monaco offered better mid-range punch thanks to a new induction system. The friction problems were addressed in the ‘Spec 3’ variant here at Silverstone. 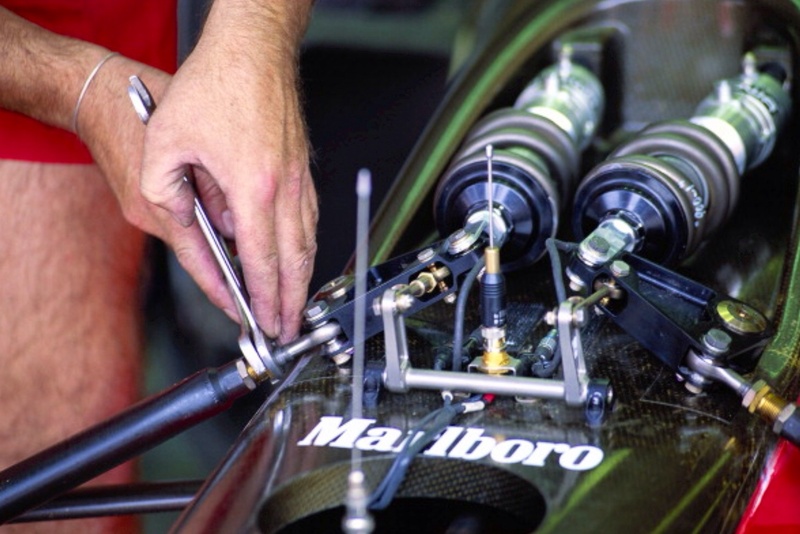 In addition the cars suspension was evolved, new linked rocker arms were fitted to reduce roll and a cockpit-adjustable ride-height mechanism was deployed. The fuel metering issues so obvious during the British and German Grands Prix weekends were mainly caused by Shell’s experimentation with different fuel densities and viscosities. At Silverstone Nigel Mansell and his Williams dominated at home, other than for part of the first lap- Senna jumped from grid 2 and led until Mansell passed him into Stowe, the Brit led from start to finish. 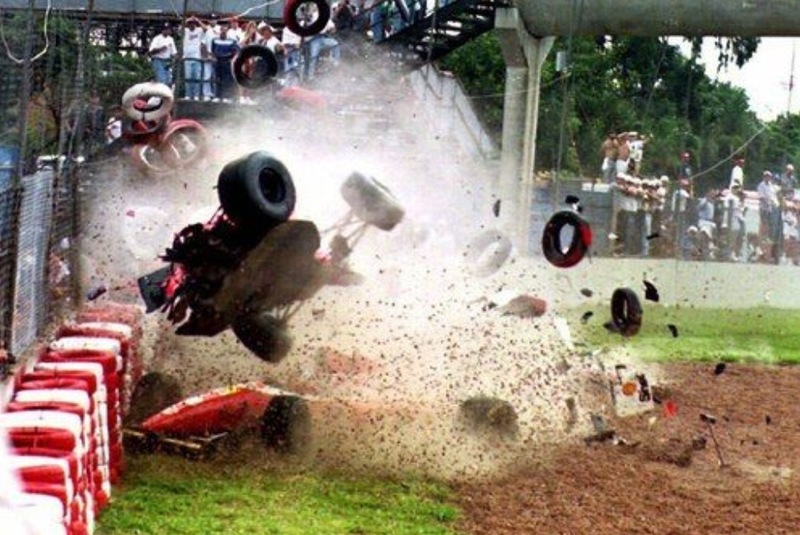 Nigel and Ayrton drove away from the rest leaving Berger, Prost and Alesi scrapping over third, a duel settled in Jean’s favour, he lost the place later in the race in a collision with Aguri Suzuki. 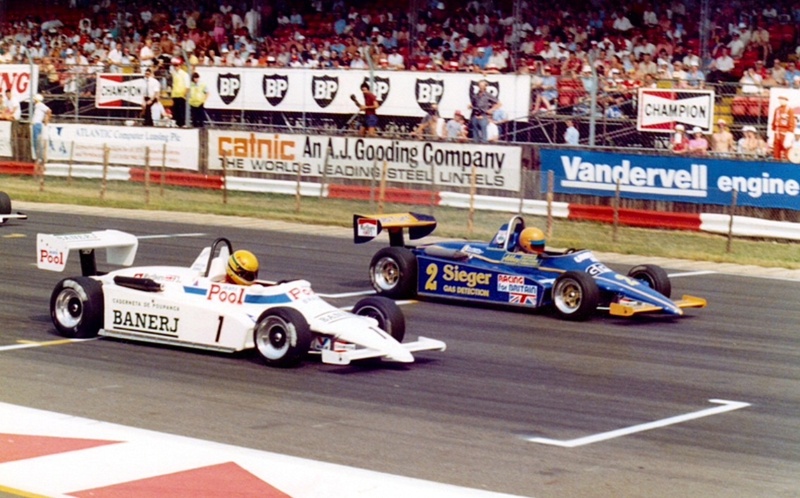 Mansell won from Berger’s McLaren and Prost’s Ferrari 642 V12 with Senna classified fourth having lost his hard-raced second after running out of fuel, as written above. In Budapest McLaren regained its form in order to able to save its season. 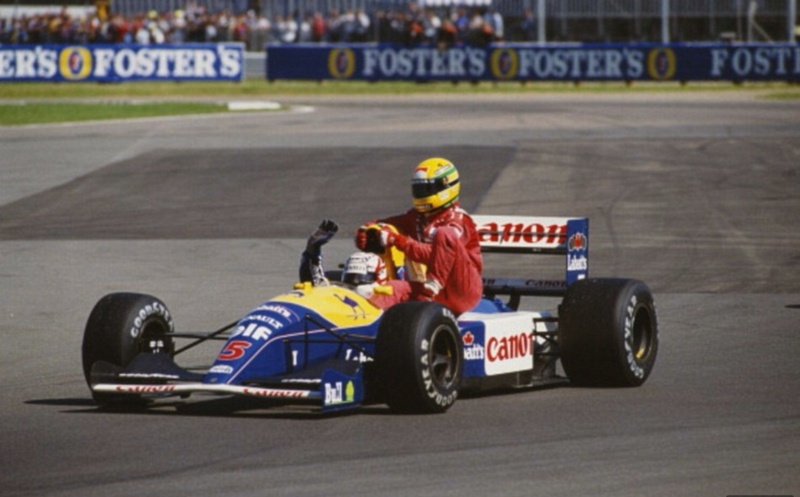 With great chassis balance and another reworked engine comprising lighter cylinder heads, camshafts and connecting rods, Senna pulled out some of the magic only he possessed and pushed the Williams FW14 Renault RS3 3.5 V10 duo back to second and third places. Despite a ‘box failure he did it again at Spa where he nursed the failing car home and saw his lead over the Williams boys grow significantly after another Mansell retirement due to an electrical problem lost the Brit a ‘sure win’. Then Williams had two wins- the Portuguese (Patrese) and Spanish GP’s (Mansell) in a season of changing fortunes, in Spain Senna struggled on the wrong tyres. ‘At Suzuka the order flipped again, the correct tyres and yet more successful engine development leaving Senna in an unassailable position on 96 points. He returned to Brazil with a resounding third title, while Berger finished fourth with 43 points, having been handed victory by Senna in Suzuka. McLaren again took the Constructors World Championship’. 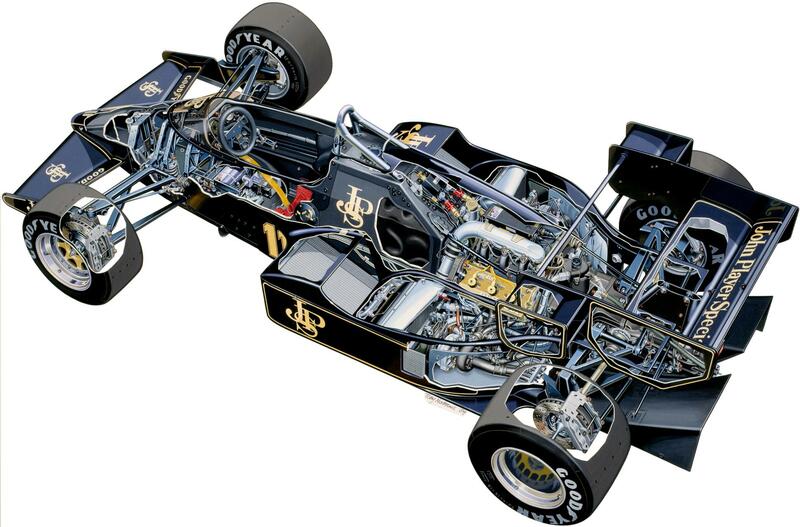 An historic sidebar to MP4/6 is that it was the last car to win an F1 World Championship powered by a V12 engine and using a traditional manual gearbox. 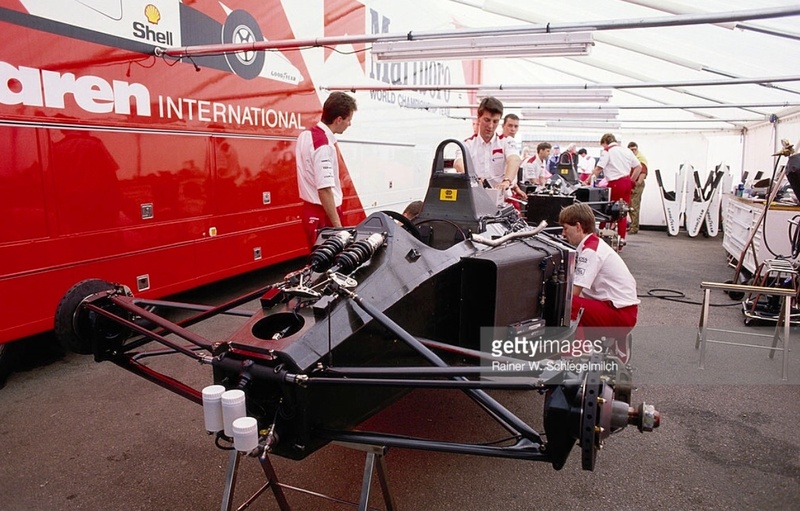 Whilst McLaren tested a semi-automatic ‘box during the season it was not deemed race-worthy so was not used, Williams and Ferrari were the only teams so equipped that season. Not a good idea to get off line! 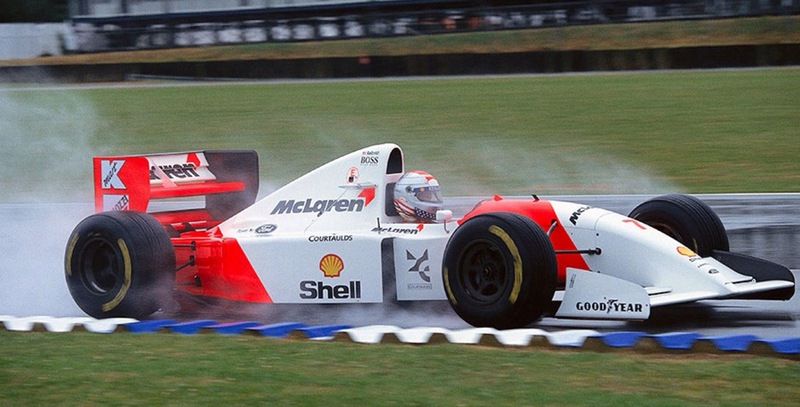 These slippery test conditions were of great use come 15 September when the race itself was run in wet conditions, the Brazilian demonstrated his mastery and deft touch by winning the race from Nigel Mansell and Alain Prost, Williams FW10 Honda and McLaren MP42B TAG Porsche respectively. Just looking these pictures, note the Ford logo on the side of the cockpit, reminded me of the vexed, too soon launched Ford Cosworth GBA 1.5 V6 twin-turbo. 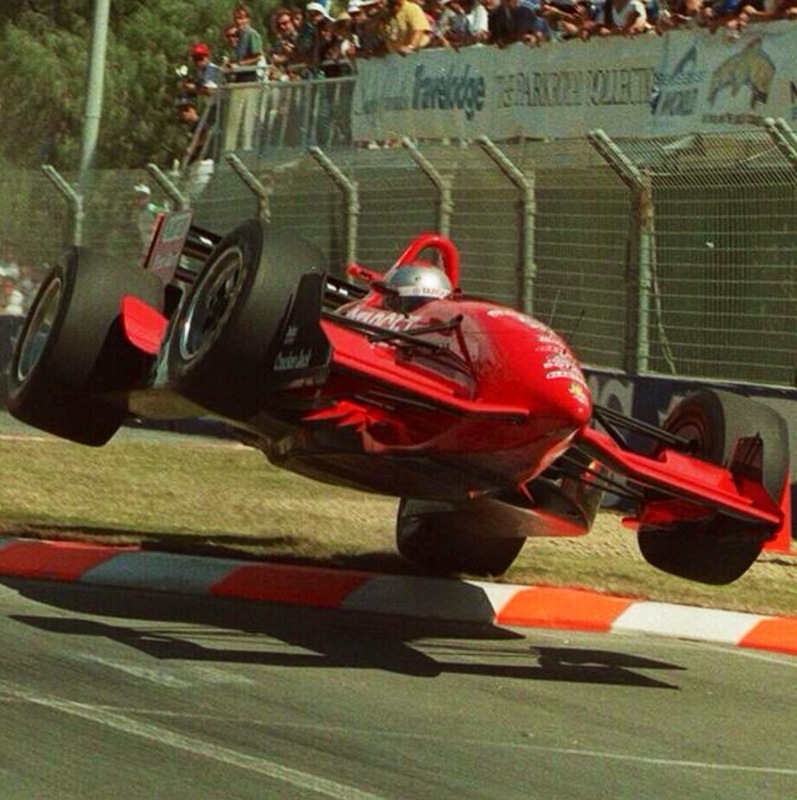 That Brian Hart built an F1 engine is an accident of history. It was an evolution of the relationship he had with the Toleman Team who won the European F2 Championship in 1980 (Brian Henton won the drivers title) with his superb 2 litre 420R 4 cylinder engine (below) in the back of Rory Byrne’s TG280 ground effects chassis. 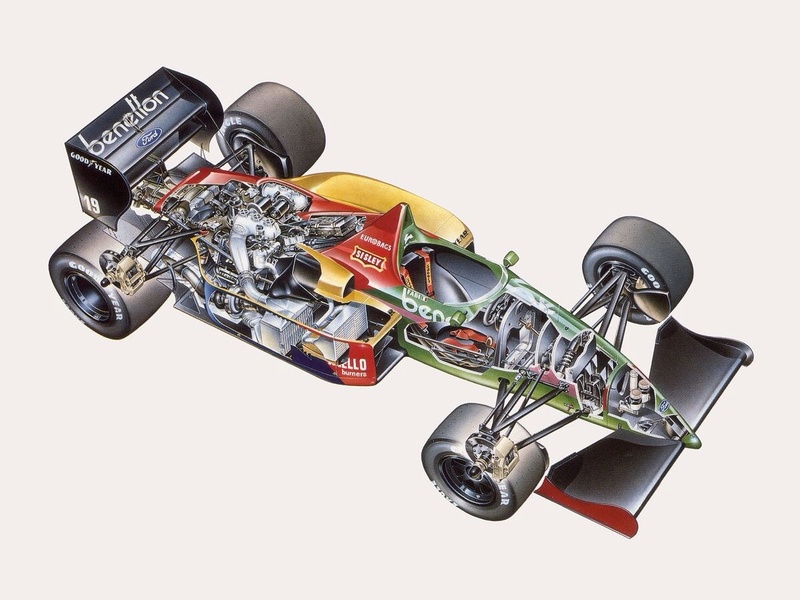 The 420R engine has a bore/stroke of 93.5 mm x 72.6 mm, a capacity of 1994 cc and was the result of a long development path starting with Hart’s race preparation of FVA’s in 1969. Designed in house, blocks and heads came from Stirling Metals with the machining done at Harts. Gordon Allen produced the cranks, Hart did his own cams and developed the pistons with Mahle in Germany. Lucas provided the fuel injection. The engine developed 305 bhp @ 9,500 rpm with safe bursts to just over 10,000 rpm. Ted Toleman’s wealth derived from building up the UK’s largest car transport business, his ambition extended to graduation from F2 to F1. Rory Byrne designed what became the TG181 chassis which team manager Alex Hawkridge told Brian would either carry a turbo-charged version of the 420R or Lancia’s turbo 1.4 which was doing service in their sports-racer at the time. So Brian set to with the challenge! ‘I had never even seen a turbocharger,’ Hart claims, ‘and I didn’t understand intercooling’. His engine was the first British turbo Fl engine and the TG181 was as ‘big and butch’ as the TG280 was ‘nimble and slinky’. Packaging of these early turbo-cars was a big challenge even with the resources of Ferrari whose 1981 126CK was no picture of elegance either. 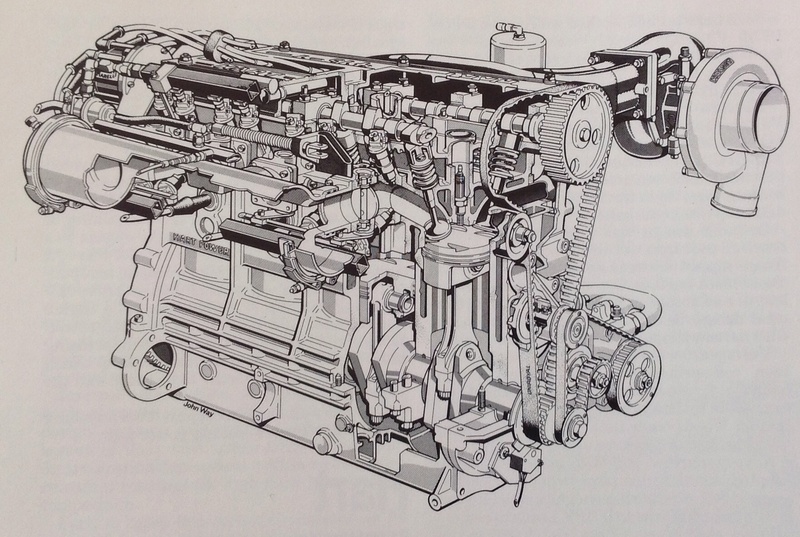 The first beautifully integrated turbo was John Barnard’s 1984 McLaren MP4/2 TAG Porsche largely because he prescribed very thoroughly the packaging of his engine spec to Porsche to ensure the needs of his chassis, particularly its aerodynamic effectiveness were not compromised by the engine and its ancillaries inclusive of radiators and intercoolers. The first iteration of the 415T had a bore and stroke of 89.2mm X 60mm and a capacity of 1499cc. With a compression ratio of 6.7:1 and single KKK turbo-charger the engine developed circa 557bhp at 9500rpm compared to its competitors; normally aspirated Cosworth DFV circa 500bhp and Matra V12 510. The turbos were the Renault V6 540, Ferrari V6 560 and BMW in-line 4 557bhp. The 415T engine was down on power and prone to head-gasket failure, drivers Brian Henton and Derek Warwick who had enjoyed so much Hart F2 success in 1980 repeatedly failed to qualify. Brian Hart raced with success, he dominated the 1172cc Clubmans formula and later raced in FJ, its successor F3 and in F2 during its most competitive period with grids full of ‘graded’, moonlighting GP drivers. He raced the brilliant Mike Costin designed Protos 16 powered by a Hart prepped Cosworth FVA, a highlight setting fastest lap and finishing second to Frank Gardner’s works Brabham BT23 FVA in the slip-streaming blast title qualifier at Hockenheim in 1967. He was 11th in the Euro F2 Championship that year and 14th in 1968 driving a Merlyn Mk12 and Brabham BT23C both FVA powered . Brian originally trained at De Havilland Aircraft, then worked for Cosworths when they were building/developing the 1600cc Ford FVA F2 engine, the precursor to the great DFV in the initial 1966/7 partnership between Cosworth and Ford. 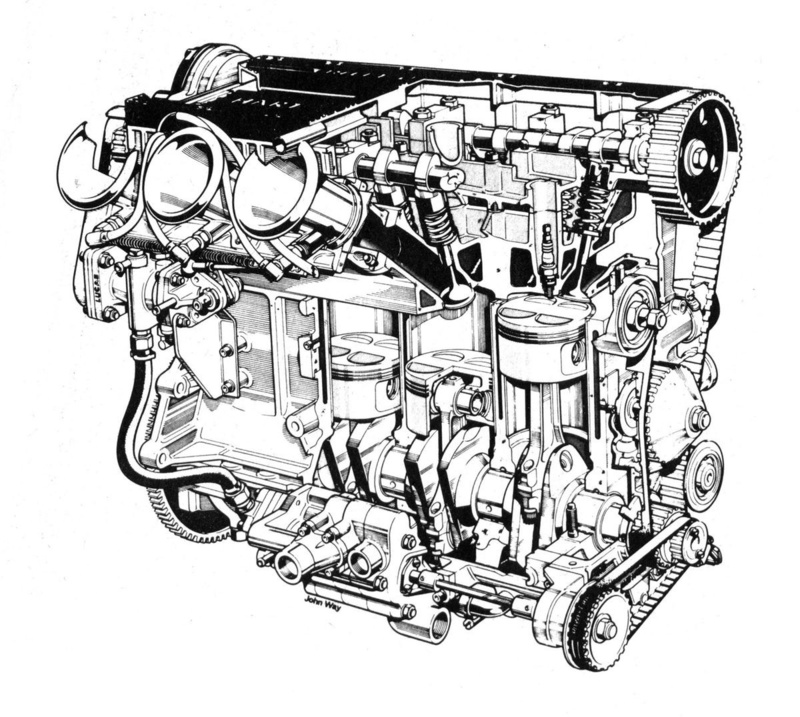 A turning point with the 415T was when Hart decided to build the engine as a monobloc, that is no separate head joint to be sealed against coolant, boost pressure and combustion leaks; ‘I decided to cast the head and block as one and in about a fortnight we gained 130bhp. 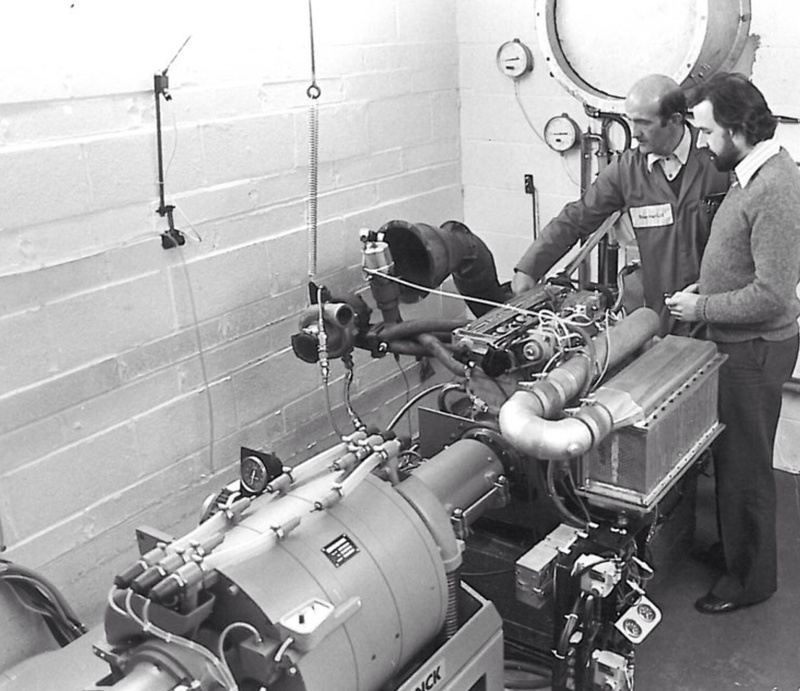 Hart also used British Holset turbo-chargers and benefitted from their flexibility and willingness to develop their products to suit the engine. ‘And the new car (1982 TG183) was 90 per cent better’ Hart quipped. In 1985 development was hamstrung early in the year when the team could not test as they had no tyre contract, this problem was solved when they bought the Spirit teams contract when they withdrew from F1. By this stage with Holset turbo, Hart/ERA digital engine management and Marelli fuel injection at 2.5 atmospheres of boost the engine developed about 740bhp at 10,500rpm. A fantastic moment was when the car qualified on pole in the German GP after second session times were impacted by rain. The engine was estimated to be giving about 825bhp in qualifying spec with about 730 in race spec but reliability to a large extent had been lost. 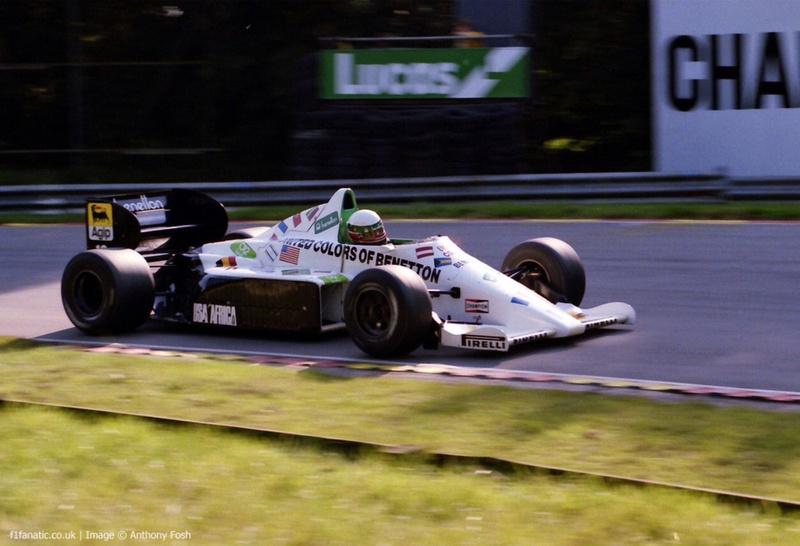 The Toleman team was acquired by Benetton later in 1985, who used BMW engines. It was a relief for Hart who struggled with small budgets and too many customers (Spirit, RAM and Beatrice-Lola) ‘I had my arm twisted to do other teams. Toleman simply couldn’t fund the development. 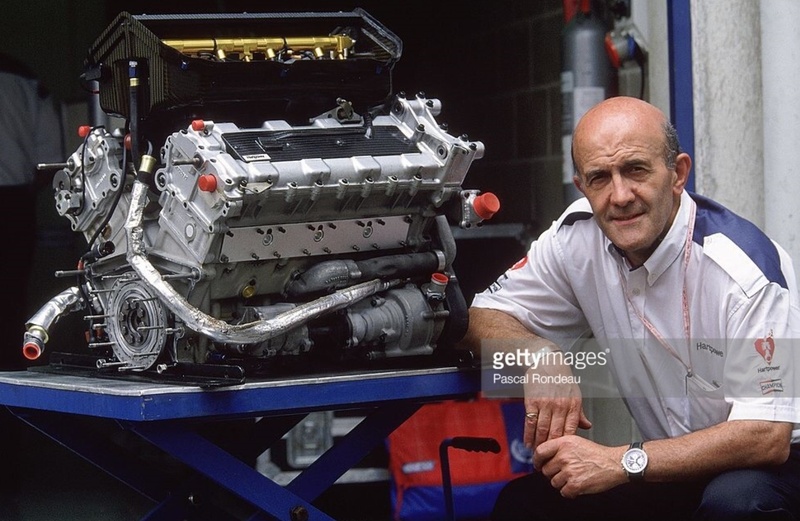 I once told Paul Rosche (BMW’s engine guru) what we had to spend, and he said they spent that on blocks alone’ Hart recalled in a MotorSport interview. Hart 415T; aluminium 4 cylinder monobloc weighing about 140Kg. Belt driven DOHC, 4 valve, fuel injected, intercooled and single Holset turbocharger 1459cc (bore/stroke 88X61.55mm). Between 650-825bhp at 10500 rpm depending upon spec and year. Going back to the Ford GBA engine early in the article, Benetton raced the ‘works’ Ford GBA’s with a modicum more success in 1987, 5th in the constructors championship won by Williams Honda the best result that year a 3rd in Adelaide for Thierry Boutsen at the seasons end. 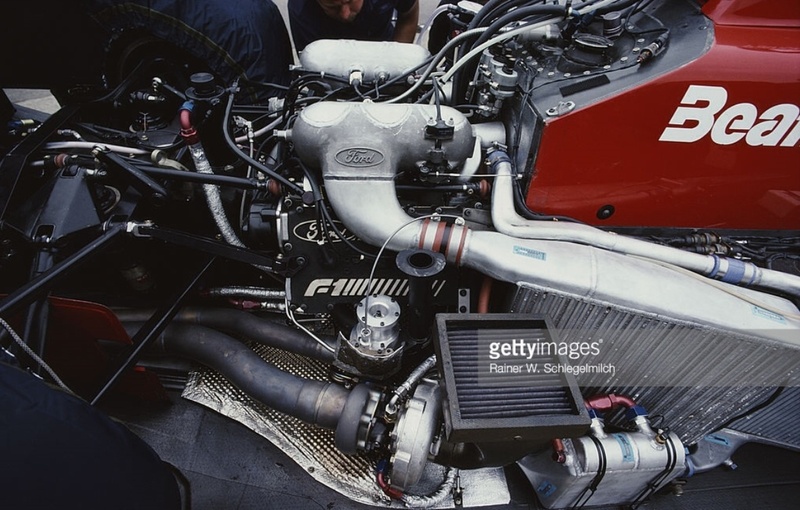 After working on the development of the Ford Cosworth DFR in the early 1990’s Hart built the 72 degree 3.5 litre V10 ‘1035’ which was used by Jordan with successful results in 1993. For the 3 litre formula in 1995 he ‘chopped a couple of cylinders off’, maintaining the 72 degree Vee angle to create the ultra compact ‘830’ V8. Known fondly as ‘Jam Tart’, this immensely popular member of the F1 paddock died too young at 77 in 2014. The front suspension comprises upper and lower wishbones and pushrods, one of which is being adjusted, actuating coil springs and Showa dampers. Carbon fibre chassis of course. The 3.5 litre V12 car was designed by a team led by Neil Oatley. 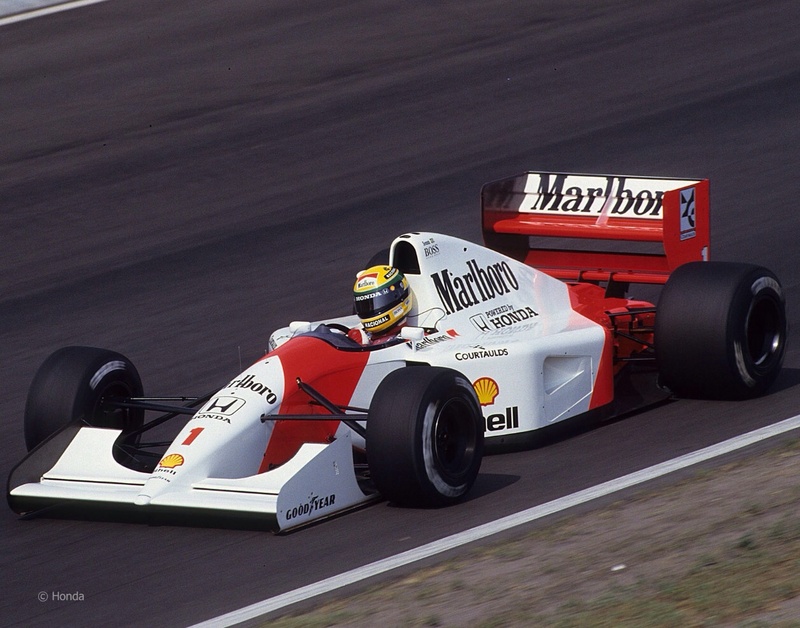 Ayrton Senna and Gerhard Berger raced the cars to 5 wins, including Senna’s race victory in Hungary (below), but struggled to match the pace of Nigel Mansell’s Williams FW14B Renault that year. Posted: May 31, 2016 in Fotos, Who,What,Where & When...? 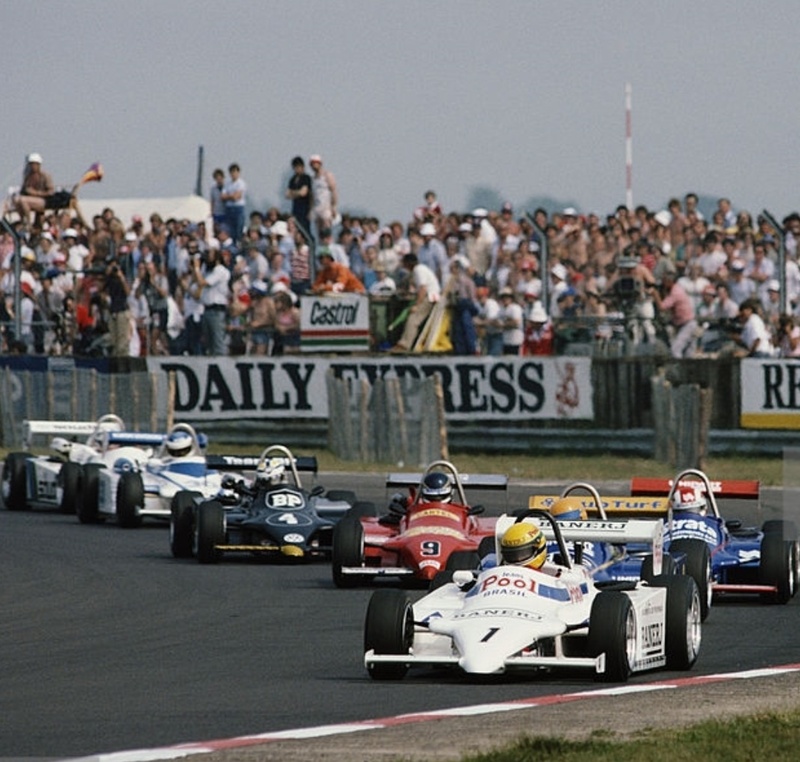 And so it was for the season; Senna’s ‘West Surrey Racing’ entry took 12 wins and the title from Martin’s ‘Eddie Jordan Racing’ 6 wins but Brundle came ‘home like a train’ winning three of the last four rounds and setting up a thrilling last round confrontation, won by Senna at Silverstone on 23 October. 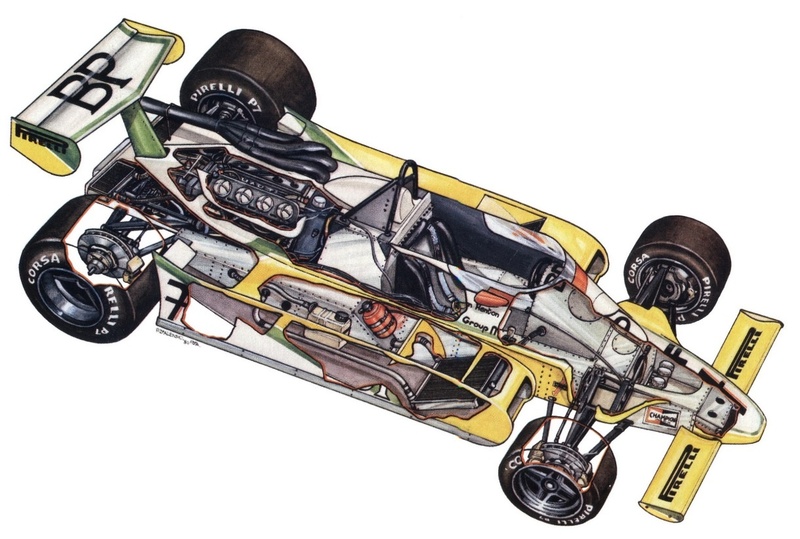 Both drivers used the dominant Toyota 2T-G powered Ralt RT3/83, the car updated from the prior year in terms of sidepods and suspension geometry. 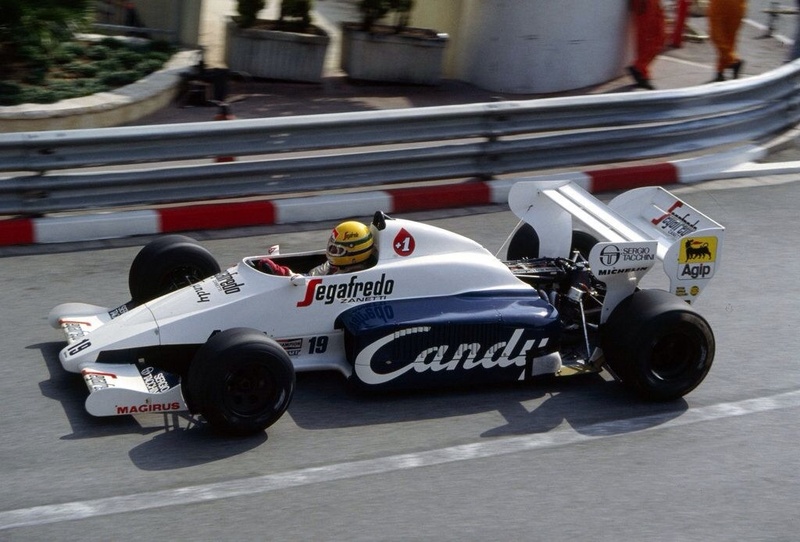 Both drivers jumped into Grand Prix racing in 1984; Senna with Toleman and Brundle with Tyrrell. I read with sadness of the death of French design great Gerard Ducarouge on 24 February at 73 years old. At the weekend I drafted this introduction to an unpublished piece on Adrian Newey…It’s been interesting to learn about and admire the careers of the sports outstanding engineer/designers before my time and since i became interested in motor racing enjoy the efforts of the design stars of the day and wait in eager anticipation of their next creations. It’s the ones who have enjoyed enduring success I have always been most drawn to. Janos’ and Chapmans’ contributions over 30 years truly amazing. 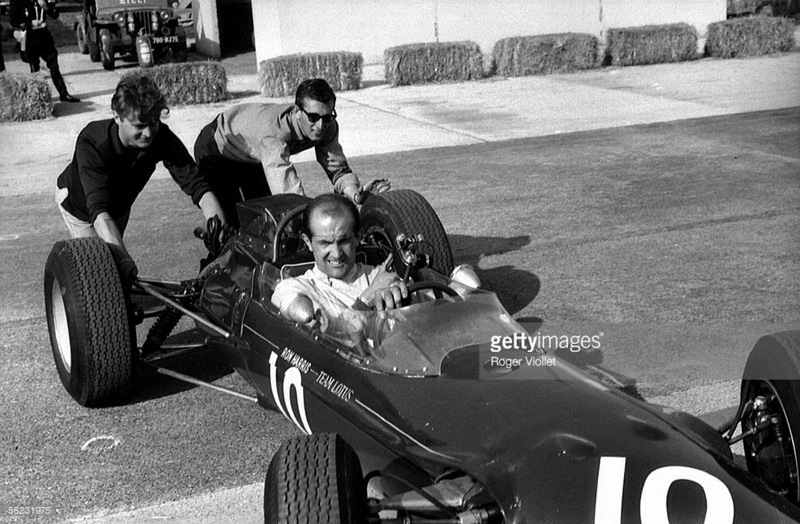 Dr Porsche, Vittorio Jano and Jim Hall predate my period of interest but Colin Chapman, Mauro Forghieri, Gerard Ducarouge, Gordon Murray, John Barnard and Adrian Newey i have followed since 1972. Ducarouge obtained a Degree in Aeronautics and commenced his career with Nord Aviation and soon moved to Matra where he worked his way up through the ranks and was responsible for the fabulous 1969 F1 Championship winning Matra MS80 Ford, Jackie Stewart winning the drivers championship and Matra the manufacturers. 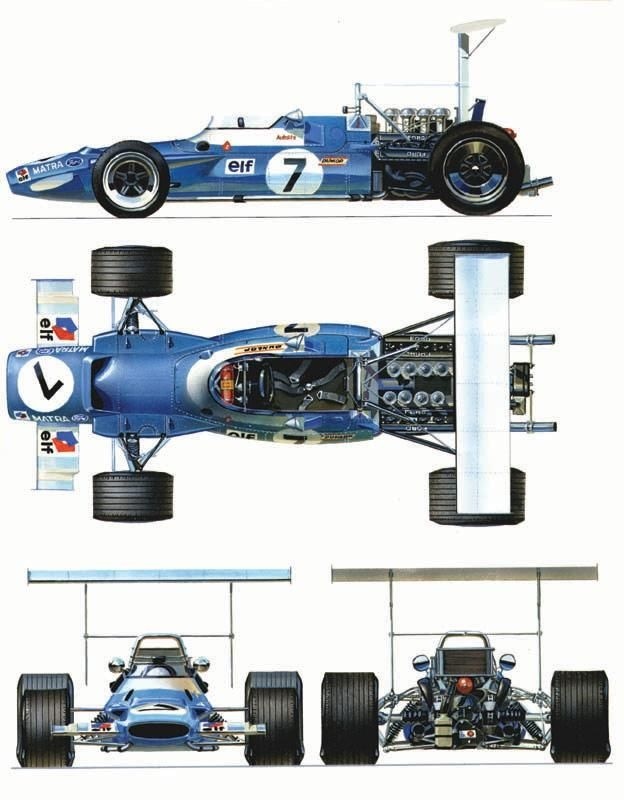 He was also responsible for the equally fabulous Matra MS670 championship winning sportscars before moving to Ligier, also Matra powered, when they entered F1 in 1976. He was dropped by Ligier in 1981 after the success of the ground effects JS11 in 1979 and 1980, moved to Alfa and then Lotus where, together with Peter Warr (team manager) and Ayrton Senna turned around the fortunes of one of the great marques which had floundered since Colin Chapmans death in 1982. The Lotus 95T Renault was very competitive in Mansell and DeAngelis’ hands in 1984 and provided a base for the 97T which followed, a winner in Sennas’ hands in 1985. He later worked with Larrousse and returned to Ligier in 1991, leaving in 1994 to return to his roots at Matra as International Development Director. Nigel Mansell started ’94 where he left off, the Brit a winner in the 1993 ‘Indy championship in his Lola Ford, the season after his F1 World Championship victory for Williams in 1992. Nige was on pole with Andretti alongside in the brand new Malcolm Oastler designed Reynard 941 Ford, the marques first Indycar. The race was restarted 3 times, first lap contretemps famous on the Surfers circuit. In the final restart Michael got the jump on Nigel and lead all 55 laps, the race shortened by 10 laps due to lack of light. Michael won again in the Reynard later in the season at Toronto but the Penske PC23 was the best car of the season and the ‘Dream Team’ of Al Unser, Emerson Fittipaldi and Paul Tracy extracted all the car had to offer winning most rounds and Unser the drivers title. 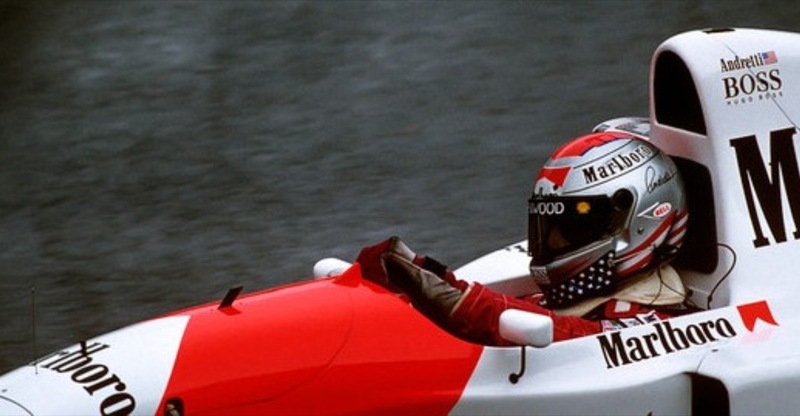 By seasons end Mansell had returned to F1 albeit briefly, with Michael competitive again with 2 victories and 7 top 5 finishes in a year where the pickings were slim for all but Penske. Andretti came into racing via Karts, Formula Ford, Super Vee and Formula Atlantic. Before long he was an established Indycar Star and after a dominant season in CART 1991, on pole 8 times, winning the title and demonstrating his versatility with a Porsche drive at Daytona, he was looking to F1 as the next challenge. Joining McLaren for 1993, alongside established team leader and candidate for the Greatest Grand Prix Driver ever was always going to be a tough ask, the Brazilian famous for taking no prisoners and intimidating his teammates in all ways possible. 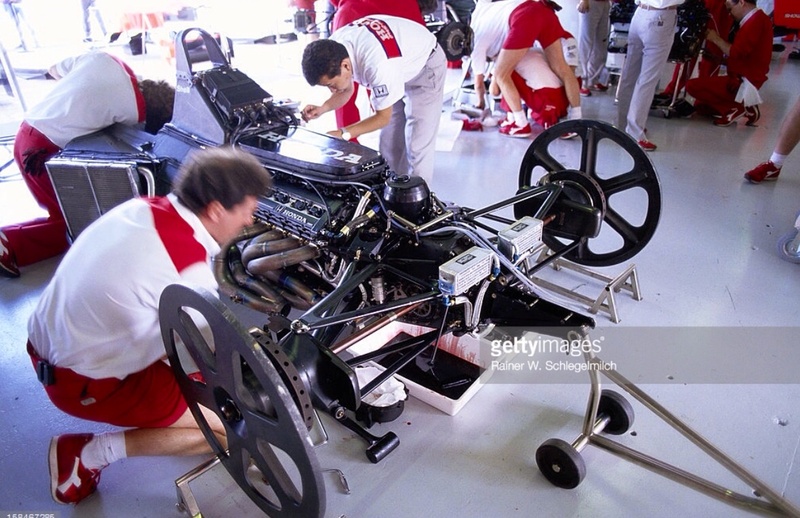 Into 1992 things were looking a bit grim for McLaren…the teams performances were down, Honda were withdrawing from F1 and Ron couldn’t achieve the alternative factory engine deal he wanted. He attempted to buy Ligier to get the Renault engines, a deal vetoed by sponsors. The best he could achieve was Ford customer engines, one spec below those used by Benetton, who had the factory Ford deal, Michael Schumacher of course the driver. Ayrton was watching all of this but couldn’t get a better drive, the best seat was with Williams, and engine supplier tipped Alain Prost into it rather than arch rival Senna. Ron needed a name driver in the event Senna decamped and signed Andretti…on paper a driver with potential albeit unfamiliar with both the cars and circuits. 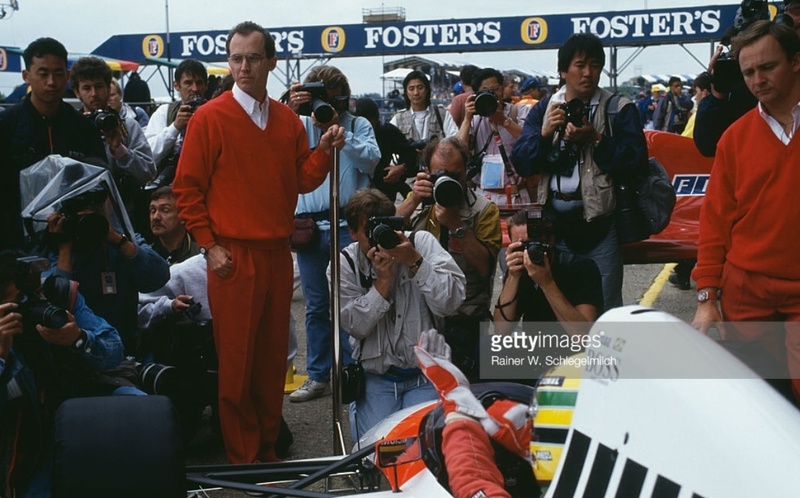 His announcement was made at the 1992 Italian Grand Prix to a bemused media. The plot thickened somewhat with the signing of Mika Hakkinen, lately of Lotus, who was to be either test driver or race driver in 1993 depending upon what Senna decided, the Brazilian ultimately signing for the team again but on a race by race basis. For Andretti things started badly with rule changes which limited testing…he badly needed seat time in both the car and on as many circuits as possible, the differences in characteristics between the relatively heavy single turbo 2.65 litre V8 Indycars, and 3.5 litre normally aspirated peaky, light, nimble and ‘very nervous’ Grand Prix cars immense. The delivery of the Ford engine was late, only a month before the season opener at Kyalami, so was completion of the car and critical systems testing and checking which became clear with many failures particularly on Andrettis’ chassis during the year. His season could be summarised as a series of own goals, accidents of his own making and mechanical or electrical failures which were entirely beyond his control. Mixed in with that was his sheer pace which justified Andretti a second season in F1, at least. F1 wisdom seems to be, including McLarens website, that the American didn’t really commit to F1. Indicative, in this view is continuing to live in the US, commuting by Concorde to the UK and the races as required. The theory is that living closeby to Woking, shootin’ the breeze with the Ronster and technicians would have helped. It probably would have, as he would have done the testing miles Hakkinnen did but it’s too simplistic a view. Jackie Stewart was smart to sign with BRM not Lotus for his debut F1 season in ’65, he had the choice but figured the lower pressure environment at BRM would be better for him, and allow him to come up to speed without the pressure of going head to head with Jim Clark, the standard by which all other drivers assessed themselves at the time. 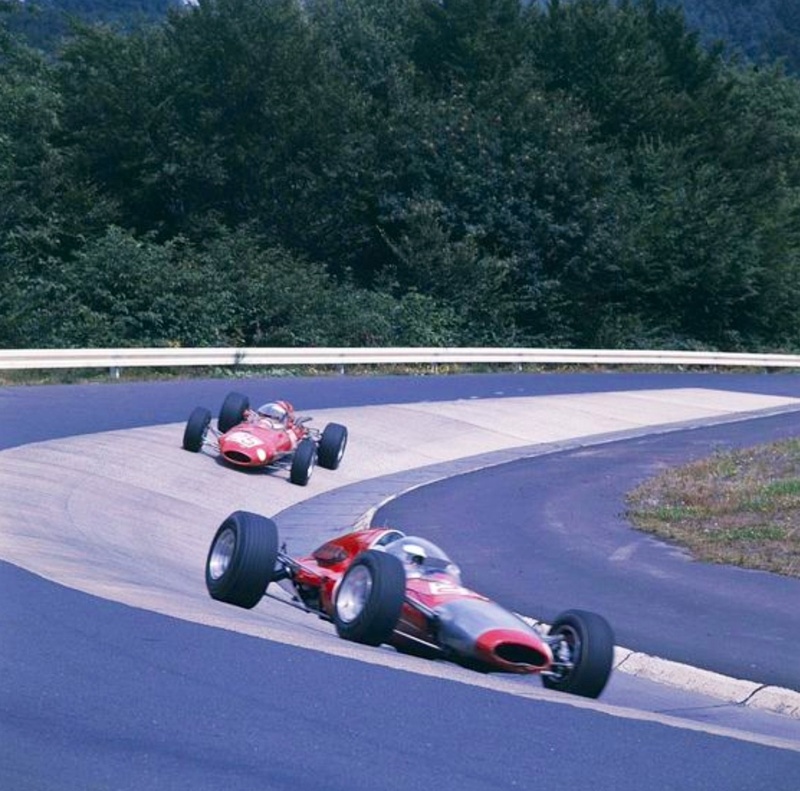 Noting that his BRM team leader, Graham Hill, the ’62 World Champ was at the top of his game at the time. But these guys aren’t like you and I, they have towering self belief, why not go up against Senna in a great team, the chance may never come again? In that sense Andretti is be admired for putting his balls on the line, he was not the first or last Ace to be blown off by the Brazilians mesmeric other worldly skill. On balance, looking from everyone’s viewpoint; McLarens’, Andrettis’ and the sponsors’, the deal made sense. 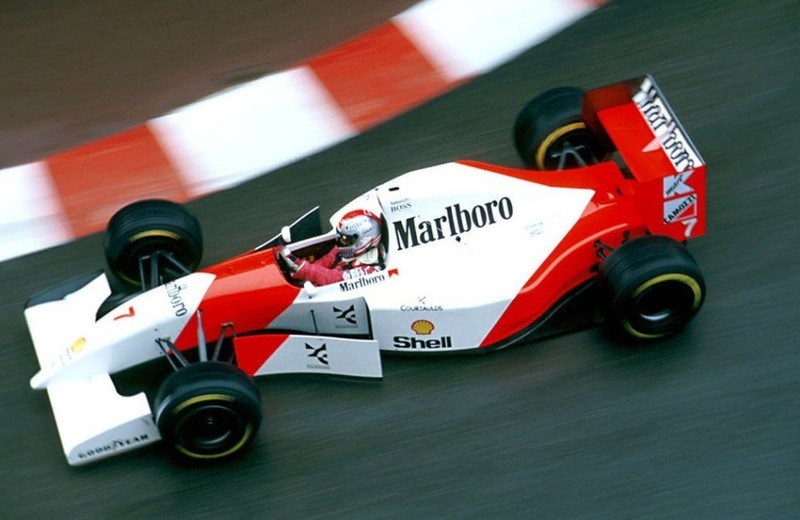 The McLaren MP4/8 Ford was a competitive car, Senna took victories at Monaco, Donington (one of his best) Brazil and Suzuka in the rain and in Adelaide, his last GP for McLaren and final victory. During the rest of the season the Williams of Prost and Hill were the class of the field, Prost taking the title and retiring. .Kyalami clutch failure on the line, fundamental preparation or lack of testing issue. He then ran into Derek Warwick on lap 4 trying to make up for lost time. .In Brazil he goosed the start having muffed the 1-2 shift, qualified 5th (Senna 3rd), Wendlinger jigged one way, Michael the other collecting Bergers Ferrari initiating a spectacular shunt with the two cars cartwheeling thru the air. .At Donington for the European GP. Q6 whilst Senna disappeared into the gloom in a sublime drive, from 5th to 1st in 10 corners and a lead of over 4 seconds at the end of lap 2. Andretti again took out Wendlinger leaving the Sauber and McLaren beached in the Leicestershire mud. .At Imola for the San Marino GP Q6 again, he completed 32 laps before spinning, whilst dicing for fourth with, you guessed it, Wendlinger. The spin was induced by a brake or suspension balance problem. 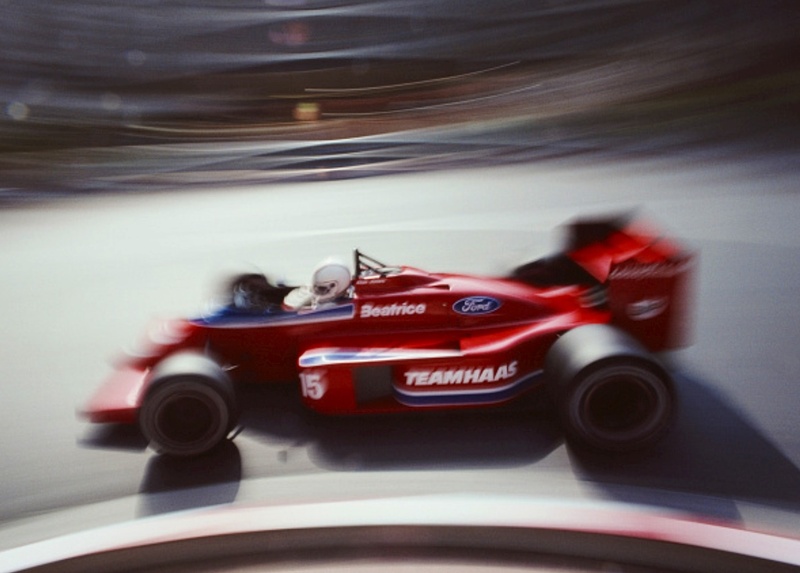 .In the Spanish GP Andretti finished fifth behind Prost, Senna, Schumacher and Patrese, the latter duo Benetton Fords with the factory engines.
. At Monaco Q9, his clutch did its own thing, up shifting early, losing revs and power, he was engulfed by the field, then hit Barbazzas’ Minardi up the chuff at Loews. 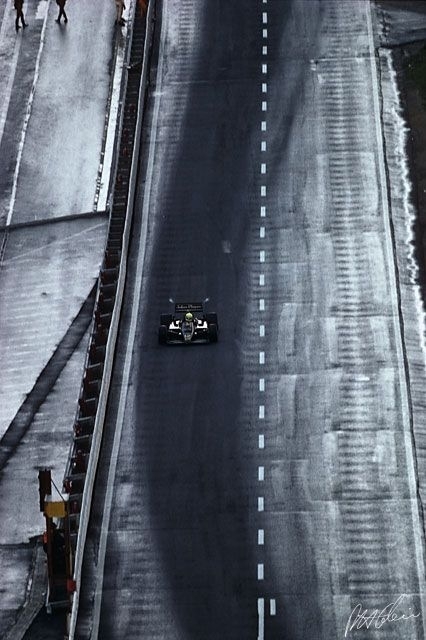 He pitted to replace his front wing but then had a great run from last to 8th…but Senna won. 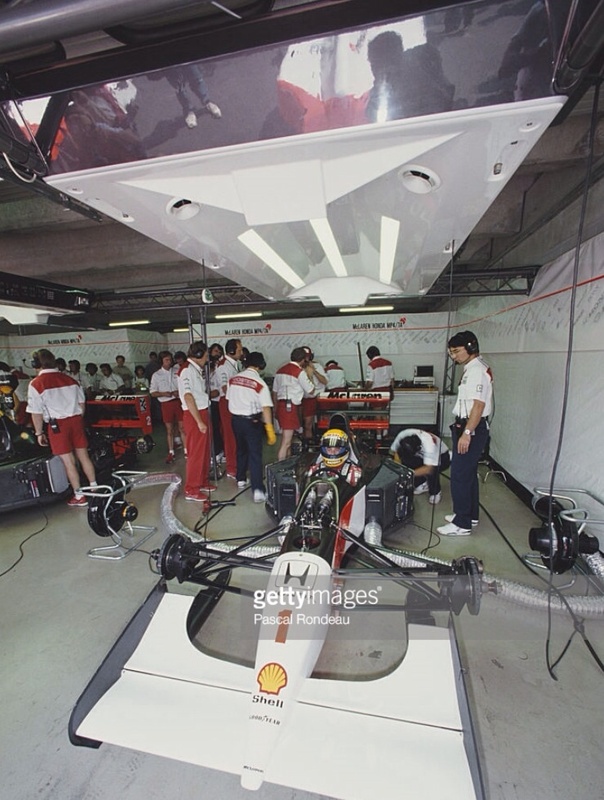 .In Canada the car again ‘cacked itself’, this time a dead battery, he started the race 3 laps down and was classified 14th, Senna also had electrical gremlins that day, finishing 18th with alternator failure. 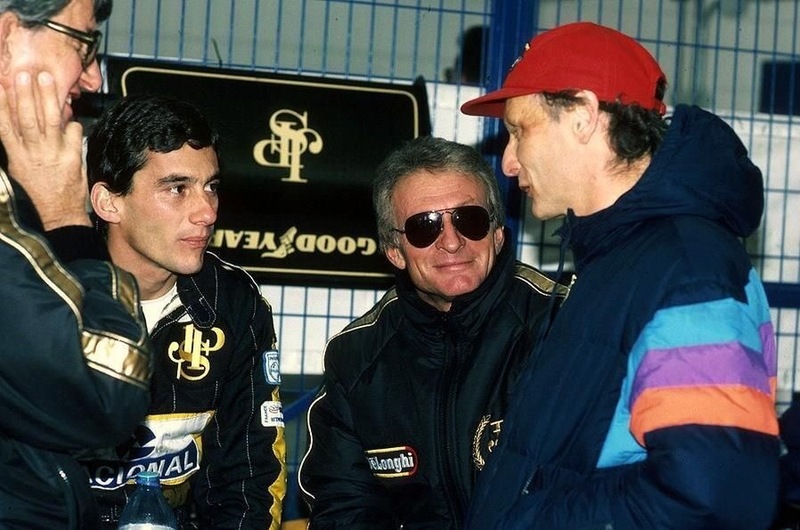 Whilst in more recent times (2008) there have been claims by Marco Andretti that McLaren ‘sabotaged his fathers career’, the claims don’t hold water as Senna had as many gremlins as Michaels’ cars did. Hakkinen was ‘standing in the wings’ but McLaren had every commercial and sporting reason for Andretti to succeed not fail. 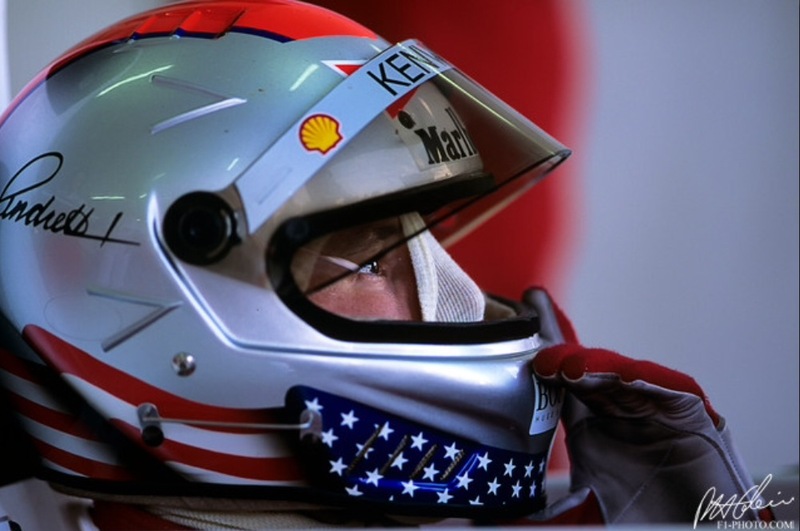 Andretti was the only American F1 driver at the time, their was no USGP either, the US is the largest global economy which McLaren was keen to tap into via the interest provided by their American driver…the conspiracy theory makes no sense to me at all and contradicts the facts. .In France at Magny Cours the semi-automatic shift misbehaved resulting in Q16 but a strong showing, finishing 6th and getting valuable mileage. .Michael looked forward to Silverstone as he had tested there pre-season, but his qualifying run was spoiled by rain, Q11. He started well but spun on lap 1 again going too hard too early. .German GP, Hockenheim he qualified 12th after more mechanical dramas unrelated to him. But he thumped Berger on lap 4, DNF. .At the Hungaroring, his fly-by-wire throttle failed in a run as high as 4th. Senna experiencing similar problems 2 laps later. .Monza, Italy. Andrettis’ final GP. He qualified 9th, Senna 4th. 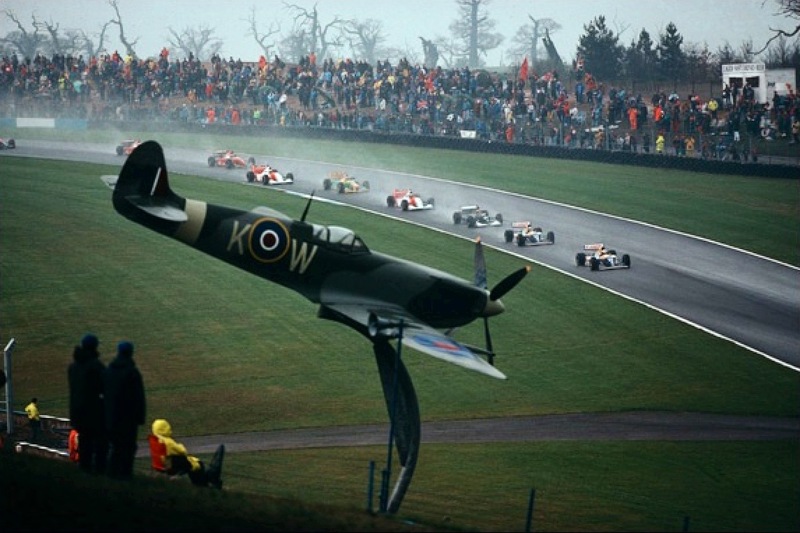 In the race both cars had brake balance problems, both spinning, Senna into retirement. 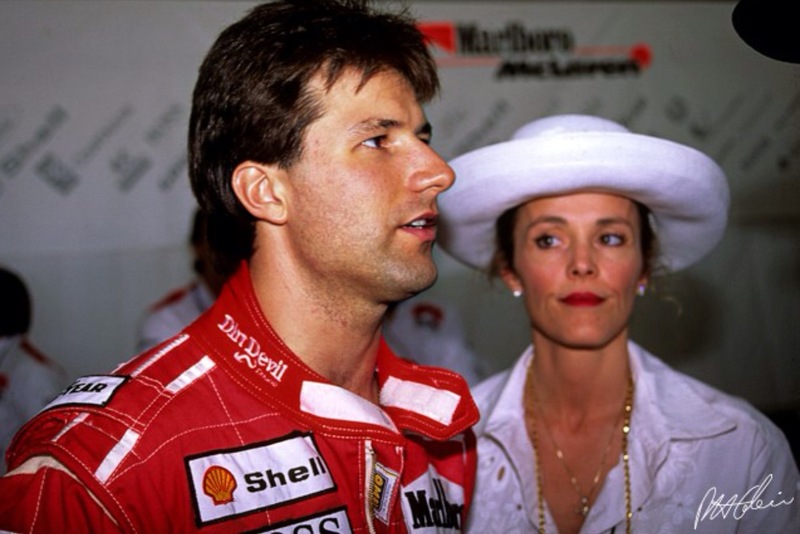 Andretti continued after having grass removed from the radiators, fighting his way back through the pack from 20th to 3rd, a great run and his only podium finish, ironically in his last race, Michael being sacked, the drive going to Hakkinen. If McLaren had done a better engine deal or installed the Ford earlier, maybe the glitches both drivers experienced all year would have been sorted in pre-season testing. If the testing rules hadn’t changed Andretti would have driven the miles he needed in cars alien to him rather than doing his testing and familiarisations in the full glare of race weekends…and as worked so well for Villeneuve at Williams 2 years later who did a million miles in the car on all sorts of circuits. If he had lived in the UK maybe his intent and commitment to McLaren would have been clearer. Hakkinens’ signing added to the pressure on Michael, if he hadn’t been signed, the imminent potential replacement would not have been there. If Andretti had started some of his races less agressively the DNF’s would have been reduced giving him the miles he needed and making him look less of a novice. At the end of the day none of the above happened and it made more sense for McLaren to sign Hakkinen to partner Senna for 1994 albeit Senna went to Williams and Martin Brundle got to race the McLaren Peugeot in 1994, a combination which made the ’93 cars look like paragons of speed and reliability. In short had Andretti raced on with the team in 1994 he would not have had a car capable of running at the front. 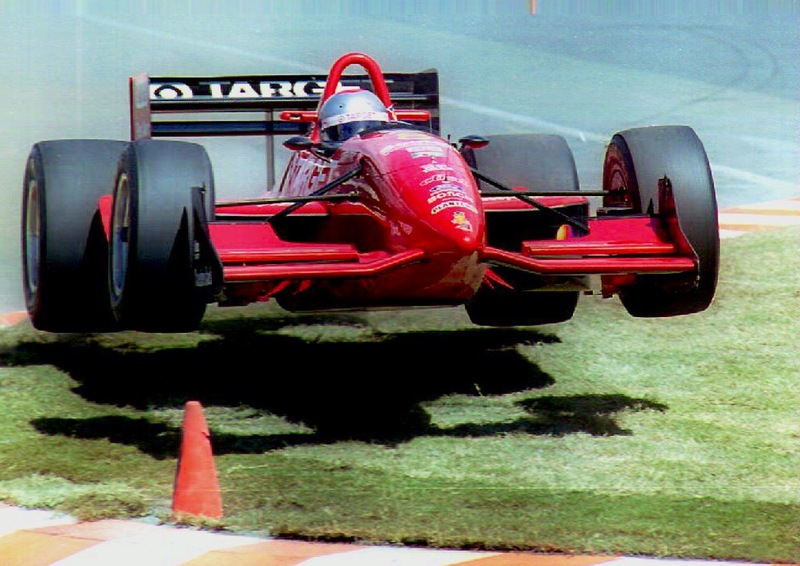 Michael Andretti and F1 is still one of racings intriguing ‘mighta-beens’ all the same?